A smooth, velvety, but balanced coffee. NESCAFE Dolce Gusto Grande. A 100% Arabica coffee. Intensity of 5 out of 11 in a long mug (at 200ml). Smooth coffee with fruity notes, a round body, and a fine crema. Discover NESCAFÉ® Dolce Gusto® Grande, a 100% Arabica coffee with an intensity of 5 out of 11. A long mug (at 200ml), this is a smooth coffee with a round body and a fine crema. Savour the freshly roasted coffee aroma and citrusy notes, in this pleasant, mug-sized coffee. 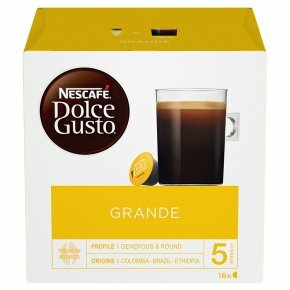 The box contains 16 capsules designed for NESCAFÉ® Dolce Gusto®' capsule coffee machines for you to prepare 16 mugs of Grande (200ml).